You arrive in Sochi international airport and we arrange transfer to the hotel. After checking in you will get your bike, we sign all needed documents and brief you about the tour details. After that we can have a short ride around the hotel. In the evening we go for a drink, take a walk in Krasnaya Polyana and prepare for tomorrow. Let’s go! Serpentine roads and mountains await us. We stop in Goryachiy Kluch to take a walk and drink mineral water from the hot spring, and next we go to Krasnodar. In the evening the city is especially beautiful. The main street is closed for traffic in the evening, so people walk there, young musicians play right on the street, all bars and restaurants are open. We’ll make sure you see the beautiful places we know, and try local food and drinks. In the morning we go to the Crimea Bridge and then to Kerch, first city where we do a stop in Crimea. We will see the very heart of Kerch, and old ferry-boat town, and see the Mitridat mountain, as well as look at Obelisk Slavy. Next we go to Sevastopol via Simferopol, Crimea capital. In the evening we have a dinner at a restaurant with the sea view. Walking city tour in the morning, boat tour after lunch. Before lunch we visit submarine museum, and then we take off and visit Lastochkino Gnezdo (Swallow’s nest), Livadia Palace. Next stop is Noviy Svet (New Light, to be literally translated), where we stay for the night with the Champaign and interesting stories. As a morning exercise, we have a 1.5 hour walk on Golitsyn’s pedestrian road. After lunch we ride serpentine roads via Feodosia and Koktebel to Abrau-Durso winery and stay for the night in Gelendzhik. Serpentine roads again, but you got used to them, didn’t you? 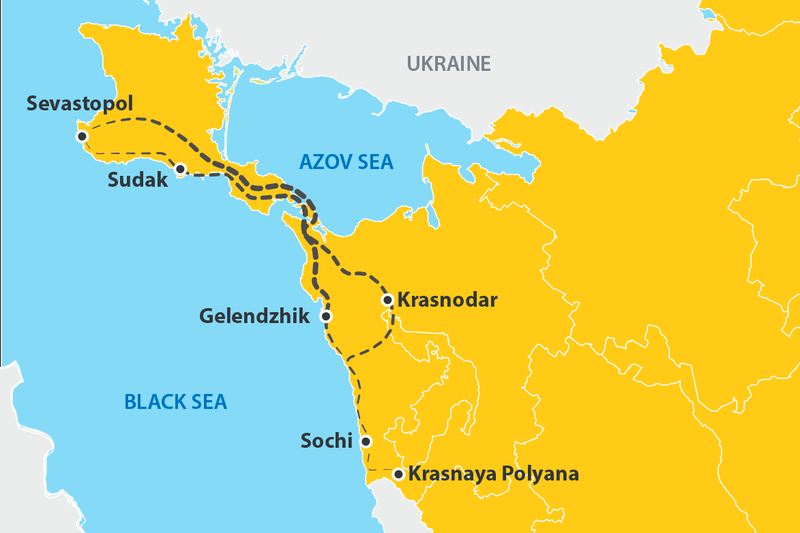 We visit Tuapse and come to Sochi after midday to ride an amazing Staropolyanskaya road. In the evening we go to Russian bath to relax and enjoy the heat. Some more time to relax and see places around, after lunch transfer to the airport. See you soon!